Sikkim…. a combination of Limbu words: su, which means “new”, and khyim, which means “palace” in reference to the palace built by the state’s first ruler, Phuntsog Namgyal. To a Tibetan, Sikkim is ‘Drenjong‘ or “valley of rice” while the Bhutia call it ‘Beyul Demazong‘ or ‘the hidden valley of rice“. The Lepcha, the original inhabitants of Sikkim, nail it with ‘Nye-mae-el’ meaning “paradise”. Another name for Sikkim is ‘Indrakil‘ or the garden of the Hindu war-god Indra. To me the names add up to one…Shangrila and I am glad I went when I did…May 2 , 2017, a spur of the moment decision. Sikkim has always been on my travel bucket list from the time I read about the wedding of an American citizen, Hope Cooke of New York to the then Chogyal’s (ruler) son. It was a script straight out of a Mills & Boon romance. The rulers of Sikkim, the Chogyal or King, were ordained by Tibetan priests and here was the Crown Prince marrying a commoner. The ‘romance’ was confined to history books when I read that India had made Sikkim an Indian state. I was in United States (Stanford Univ 1975) and it was a surprise. The Kingdom of Sikkim, founded on the famed Silk Road by the Namgyal dynasty in 17th century was ruled by a Buddhist priest-king or the Chogyal. It was a vassal state of Qing China till the British, guided by territorial and trade considerations, ordained it a princely state of British India in 1890. India became independent, Tibet a Chinese territory but Sikkim continued with its protectorate status. In 1975 the Indian military deposed the Sikkimese monarchy and Sikkim became the 22nd state of India. Thereby began the tussle in eastern Himalayas with Sikkim is the ‘Meat in a China and India sandwich’. May 2017: The direct flight from New Delhi to Baghdogra, West Bengal, is a pleasant one (Go Air) and within stipulated time, 2 hours 20 mins we descend to accompaniment of rain drops. The airport turns out to be nondescript and not-to-clean, considering its importance as a stepping stone to neighboring cities, Kalimpong, Darjeeling etc. To add to our discomfort was the ‘belligerence’ of the cab booking person when my friend requested a bigger car. ‘This is not Delhi’ put an end to further requests and we piled into an ‘Indica’, medium size vehicle, doled out extra money for luggage, and skirted our way out of the maze of cabs and onto the streets on way to Gangtok. A daunting first hour as we cross the traffic chaos in what I presume to be the outskirts of Bagdogra and it was when nature took over that we relaxed. The Teesta River is a constant companion, sometimes staid and sometimes teasing, as we drive past villages perched along its banks, the bamboo swamps and marshes, the lone fishing boats. I could guess why the inhabitants swear by this 309 km long river originating from Tso Lhamo Lake in West Sikkim and flowing through West Bengal to end in Bay Of Bengal through Bangladesh. Teesta is what River Ganges is to the people of the Northern Plains and all inconvenience of the narrow winding potholed road is forgotten and so are the dangerous curves and sheer drops, sometimes on the edge. Just before Teesta Bridge, where the roads from Kalimpong and Darjeeling meet, the river is joined by it’s main tributary, Rangeet River. The forests metamorphose from tropical deciduous to alpine vegetation and it gets cooler as we approach Gangtok. We stop at Rangpo, a hill-side village or town, for refreshing tea- break and it is between Rangpo and the railway bridge (Lohapul or iron bridge) that the Teesta rumbles down, ideal for white river rafting. We were traveling in opposite direction as the river hence it was akin to rewinding the action. Towns like Teesta Bazaar and Melli have facilities for group rafting. I had wanted to stop at some point but it was nearing evening and our cab driver preferred to be in Gangtok before sunset so that he could return to Baghdogra the same day. 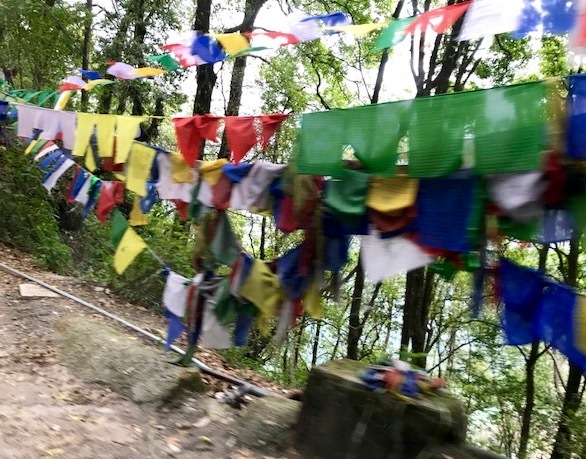 The cool watery breeze from the river, the occasional water falls and streams, the colours, predominately green and brown and as we cross into Sikkim territory the bright fuchsia, yellow, orange of clothes and prayer flags make me brush aside my pugnacity and absorb the flavours. In fading sunlight the cityscape, with ubiquitous British landmarks, alongside pagodas, monasteries, Buddhist prayer flags, churches and markets, assumes a mystical aura. The British had made Sikkim their protégée and as chance would have it we were staying in a house that belonged to Walter Hodges (1868-1938) the clerical assistant of Mr John Claude White who was Political officer of the Chogyal. The 120 years old ageing spacious bungalow, DIKIKHANG (Happy Home) situated on top of a hill flaunts tennis courts converted into badminton courts, terraced gardens, pool-now a concrete sitting area, a covered patio, tea rooms, servant’s quarters etc. The Hodges had stayed in this bungalow till 1909 before returning to Britain. 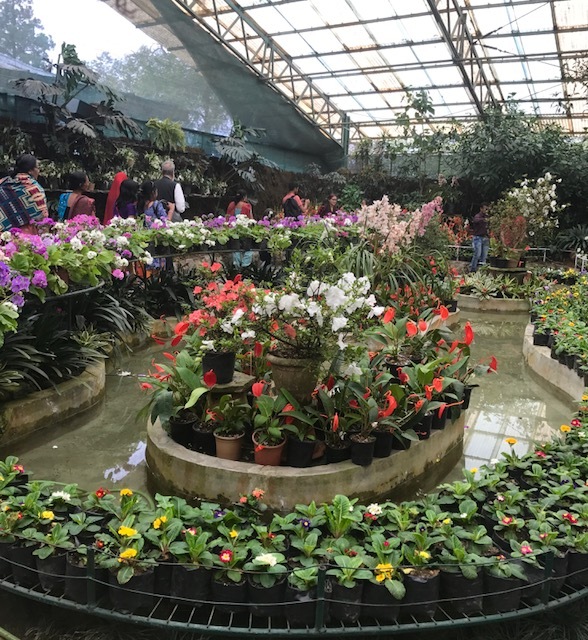 We fell in love with the colonial framework and a collective response was that one could spend days, months in this pristine setting not far from Downtown Gangtok. Day 2…. A lazy breakfast in the sun-bathed tea room and we chalk out an agenda for a drive around Gangtok. My queries about seeing the Chogyal’s palace drew tepid response and to the hired cab driver it was pointless as the walls are too high and entry prohibited. I decided to try my luck another day and our first stop of the day was the flower show being held near Ridge Park on the road that leads to the beautifully designed Palace gate with a Pagoda on other end. I walk out as soon as tourists buses (from neighbouring West Bengal, Assam) started off-loading passengers. Within minutes the tiny presentation area was crowded, reminding me of Chinese tourists and their selfie sticks in different locales and countries. I am tempted to don the Sikkimese dress, silk blouse or ‘Honju’ inside a ‘Kho’ or gown for a photo-op near the entrance but decide against it. Next door is White Hall, constructed in memory of Claude White, the first political officer of Sikkim in 1932, and Mintokgang or ‘ blossomed crowned hilltop’ the Chief Minister’s residence. It is hard to imagine the area as a ‘flower paradise’ with crawling vehicles and traffic jams along the roads. As someone mentioned that topography of Sikkim, add Gangtok, is like an elevator going straight up or straight down. Down below are the crowded markets and dwellings and as one climbs up nature presents blissful settings…a ‘lulling hammock’ for weary minds. The new Namnang walkway (pic taken from internet) as we did not stop here. 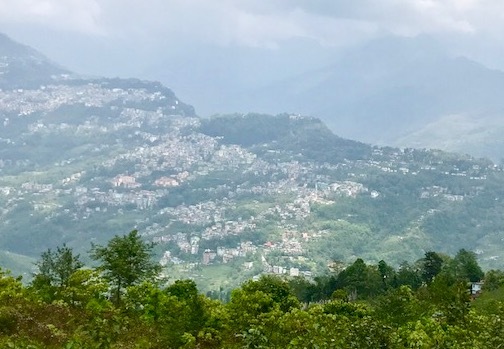 The weather was playing spoil sport, an out of season unprecedented downpour, and we canceled visits to surrounding towns, Pelling and Lachung, and had to look inwards, that is the city. Driving in the city is akin to a track event as the two lane narrow roads topped with residential and government buildings, footpaths on one side and drains on other restrict pedestrian traffic. A new covered walkway, the Namnang walkway links Deorali to M.G. Marg and New Market and is a boon in the heavy vehicular traffic. However, the city could do better on the infrastructure front, wider roads and restricting vehicles, as leaving or entering the city gates is an exercise in patience because if stuck in the queue it can take hours to reach destination. To break monotony of a wet day we visit Namgyal Institute of Tibetology, a Tibet museum and research Center promoting research on religion, history, art and culture and language of the Tibetan people. The imposing building is situated on the site donated by 14th Dalai Lama and inaugurated in 1958 by Jawaharlal Nehru, India’s first Prime Minister. The library has an impressive collection of Tibetan artefacts, Thangkas, statues, scrolls… detailing Buddhist history in Sikkim and we spend an hour reading descriptions and evaluating the cultural and historical significance of the exhibits. Photography is not allowed and this is a loss for visitors. By early evening the sky cleared and we visit the famous lifeline of Gangtok, the MG Road (Mahatma Gandhi Marg) the litter and car free zone of the city. It is touristy, yet exuding small town warmth and generic street sights, entertainment opportunities, cyber cafes, pool parlours, night clubs and shopping complexes. Everyday is fun day but if looking for exclusive programs then one is the annual Gangtok Food and Culture festival held in December every year along with music and dance performances and various exhibitions. We spend a fascinating evening, watching the young and old relax or stroll the length and breadth of the road. Plenty of shopping opportunities but I was not in purchasing mood, except for liquor, tea and cardamoms and these could wait till the last day. Alcohol is cheap, it is the largest industry in Sikkim, with beer, whiskey, brandy, rum, and Chhang the local beer available. Friends in Delhi had requested for Sikkim Fireball Special Brandy, a fruit based alcohol, the Sikkim Ginger Liqueur or Sikkim Cardamom Liqueur along with Temi Tea (Sikkim speciality) and the long green Cardamom that grows in abundance in Sikkim. 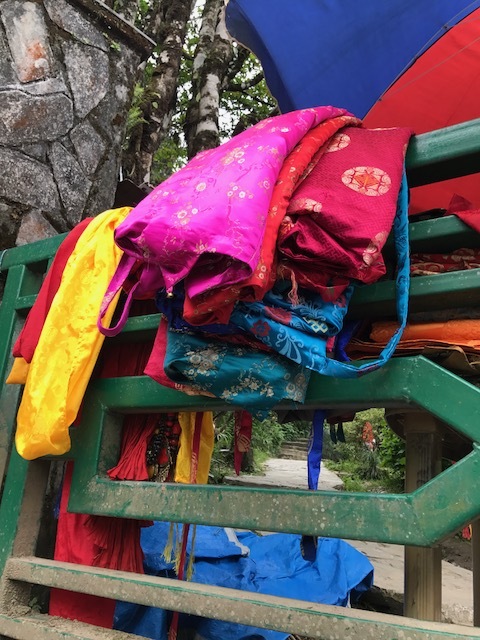 Another money spinning sector in Gangtok is the local handicraft sector …hand-made paper products using vegetable dyes, woollen garments, bamboo articles, Tibetan artifacts and curios and furniture. The unmistakable Buddhist flavor, courtesy Buddhist way of life, finds its stamp on food habits with vegetarian eateries in abundance. Cuisine in Gangtok is in line with Chinese Tibetan tastes with Momos and variants of noodles, Wai-Wai and Maggi, and vegetarian Indian fare. The popular Indian and foreign clothing brands have made their way to Gangtok along with local and Chinese products. Our cab driver introduced us to the prevailing ethnicity insisting that the language, dress and habits have taken their cue from the Nepalese. Gurkha language and people are in majority and the population is a blend of Sikkimese, Nepalese, Tibetan and other Indian groups. 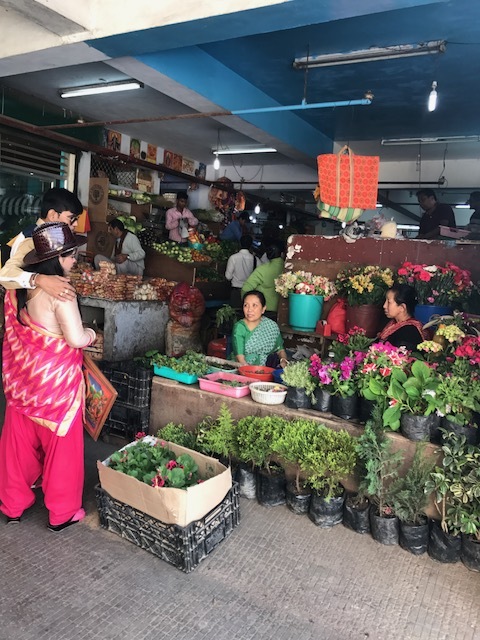 A visit to Lal bazaar, the indigenous or local market considered the ‘kitchen of Gangtok’ selling everything, mundane to exotic…. Yak milk ghee, cherry peppers, fresh trout from Teesta and the streams around, bamboo shoots ( we purchased some), lotus stem, mushroom varieties, kitchen gadgets etc. Organic produce is on an upswing in Sikkim and the state is winning awards in this field. Our host wanted to show us the famous Hindu temples, the Hanuman Tok and Thakurbari temple, the oldest temple in Sikkim, but not receiving any positive response from us, let go the idea. We still had left over sight-seeing but had to cut short our stay as my friend received news of tragedy in family. Thankfully we had visited Nathu-la and Rumtek next day of arrival so had few regrets…the main being the rhododendron valley because of persisting cold. The entire state is a ‘basket of goodies’ …..of winding roads and awesome natural surroundings placed amidst a pleasing blend of tradition and modernity, an ideal vacationing place because as a local said….it is ‘peaceful with low crime rate and polite people’. How to get there: –The point of entries… Bagdogra Airport and New Jalpaiguri railway station in Siliguri are well-connected with flights and trains from all the major centers of India. Baghdogra- Gangtok is about 123.2 km taking 3 hours 45 mins – with taxis plying at all hours of the day. For faster journey.. Pawan Hans helicopters are available on clear days from Bagdogra Airport. Thank you for the beautiful tour, TT!